Jackson Police Lt. Chris Simpson tells wilx.com the department actually has 41 untested kits, not 63. He can't say for sure where the discrepancy comes from. Possibilities include kits being sent out for testing between the time the survey was taken and when the report was released or kits being destroyed when cases were closed. Lt. Simpson says there are some kits that are being investigated and that will be sent out for testing. 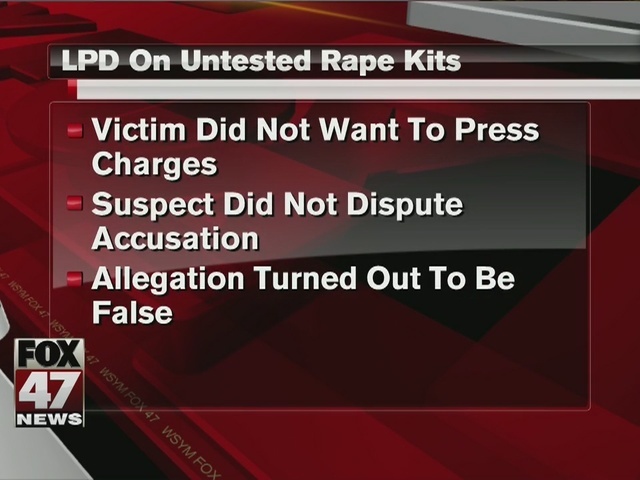 Others were never tested because victims chose not to press charges, because suspects didn't contest the accusations or because the accusations were false. Lansing Police Chief Mike Yankowski gave similar reasons for his department's 40 untested kits. He says all of them have been accounted for and that, "What we did not find in our audit were stock piles of sexual assault kits that were not assigned to investigators or otherwise unattended."